Barring a sudden collapse of the armed resistance, which for the Islamist core seems unlikely, the regime will only slowly defeat rebel forces and recover territory. But the regime is implacable and its allies are steadfast. 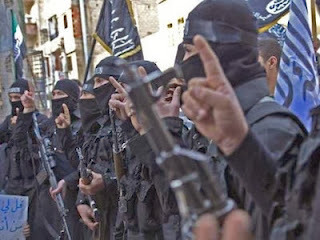 As the moderate faction of the Syrian rebellion implodes under the strain of vicious infighting and diminished resources, the United States is increasingly looking to hardline Islamists in its efforts to gain leverage in Syria's civil war. The development has alarmed U.S. observers concerned that the radical Salafists do not share U.S. values and has dismayed supporters of the Free Syrian Army who believe the moderates were set up to fail. On Monday, the State Department confirmed its openness to engaging with the Islamic Front following the group's seizure of a Free Syrian Army headquarters last week containing U.S.-supplied small arms and food. "We wouldn't rule out the possibility of meeting with the Islamic Front," State Department spokeswoman Marie Harf said Monday. "We can engage with the Islamic Front, of course, because they're not designated terrorists ... We're always open to meeting with a wide range of opposition groups. Obviously, it may make sense to do so at some point soon, and if we have something to announce, we will." Hudson notes that "Though the Islamic Front is not a U.S.-designated terrorist group, many of its members hold intensely anti-American beliefs and have no intention of establishing a secular democracy in Syria." Well, of course. But that need not be a problem, for neither side is pro-Amerian or intends to establish any kind of democracy, and we should not support either side in the hope that it will win, only that it will block the other side from winning. Syria's Islamist rebels remain enemies, but they can be useful ones. Technorati Tag: Syria and Assad and Syrian Rebels.